Blue Star Vermont: We found blue! Blue Star Vermont has two dedicated rooms in our house (although my patient and loving husband might point out the times when it seems to take over the whole house) These two rooms are swimming in color. Bolts and bolts of vibrant color. We love color. I bet you can guess our favorite color. Yes, it is blue, of course. I have been searching for a great blue fabric for aprons for quite a while now. 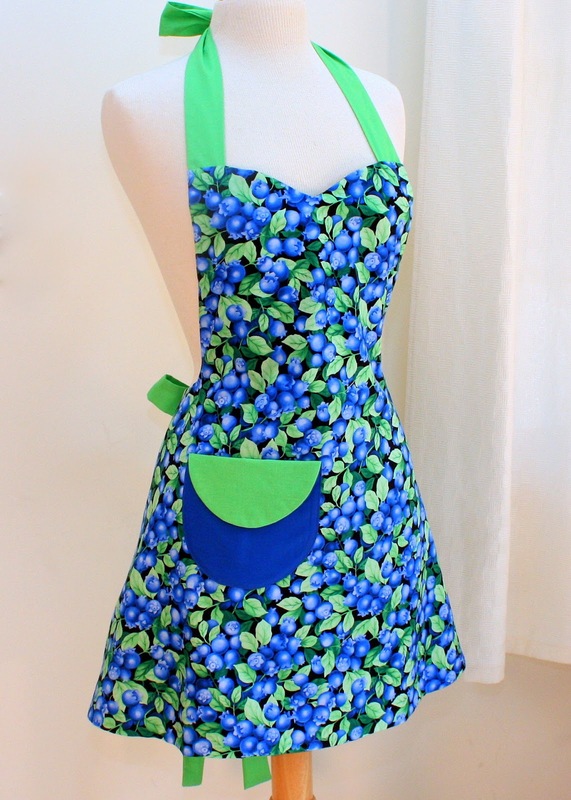 Our second blue apron, just in time for blueberry picking season, is our Women's Apron in Blueberries. This blueberries print is a sweet and as blue as it gets. Wonderful blueberries in gorgeous shades of cobalt blues, set off with a leafy green. For the shape of this apron, I decided on something new. I adapted a 1950's pattern to give it just a bit of swing to the skirt, for those who want just a bit of feminine and flirty fun. Check out that blueberry of a two-tone flapped pocket. Of course there is an Oven Mitt is Blueberries to match. So now you can choose blue at Blue Star Vermont!